Thistlethwaite is one of the six principal streets of Montague – now part of Fishermans Bend. It begins at Ferrars St, the location of the new South Melbourne Primary School. Bluestone laneways, a legacy of a time when the area was dense with houses, connect it to Buckhurst St. Many of the lots are small-ish. It goes back a way. Gazetted in 1876, it was named after William Thistlethwaite, an early mayor of Emerald Hill (later South Melbourne) in 1867/68. There were several Thistlethwaite brothers who made their mark. They had a real estate business. It is a relatively short street, about 550m, fatally divided by impenetrable traffic flowing along Montague Street. Here is a status report on Thistlethwaite St at December 2018 beginning at Ferrars St, the eastern end. Construction has begun on a 6 level office building designed by Jackson Clement Burrows on the s/w corner of Ferrars & Thistlethwaite. The development appears to be called Iurada after the father and sons construction company that is building it. The site was occupied until the late 1980s by Holvex, a roofing and sheet metal company. 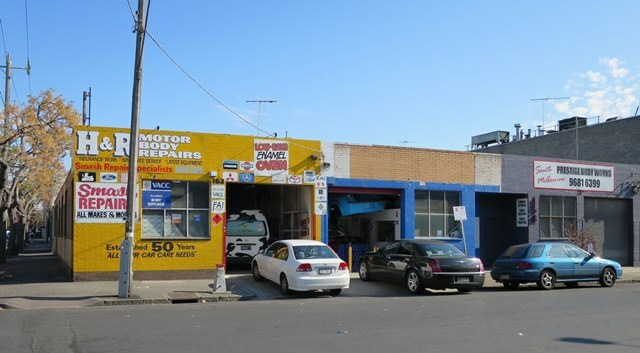 The corner site opposite, 132 – 142 Ferrars St, was an early horse out of the gate after Fishermans Bend was rezoned in 2012. A proposal was put forward in April 2013 for a 49 level building. A subsequent approval for an 18 level building has not been acted on. The site deteriorates and attracts graffiti. 0South , an eight level development by architects Rothelowman leverages ‘south’, the familiar name for South Melbourne. 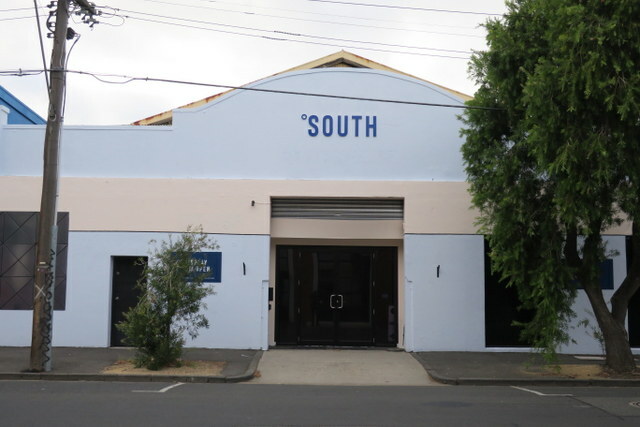 It promotes the site’s walkability and its proximity to South Melbourne attractions. Over the road, Affirm Press make it their business to nurture Australian writers with publications that ‘influence by delight’. Fronting the street is the newly opened Wise Barista which provides ‘training and meaningful employment opportunities for individuals facing barriers to employment though the art of making coffee’. Advertising for Lillix by Bruce Henderson architects invites the interested person to Spec Property’s display suite in Franklin St, near the Queen Victoria Market. The site has been cleared but no construction has begun yet. The Olympia gym anchors the corner of Montague and Thistlethwaite Streets as it has for 30 years ‘inflicting pain since 1991’. As they rightly boast on their website ‘anyone who has driven along South Melbourne’s Montague Street knows Olympia Gym’. That’s a lot of people. Now have to walk left to cross Montague St safely at the lights at City Road to continue along Thistlethwaite St. The character changes. Around the corner in a former bakery is the studio of blacksmith David Wood. Wood created five great gates for the 150th anniversary of the St Kilda Botanical Gardens in 2011. 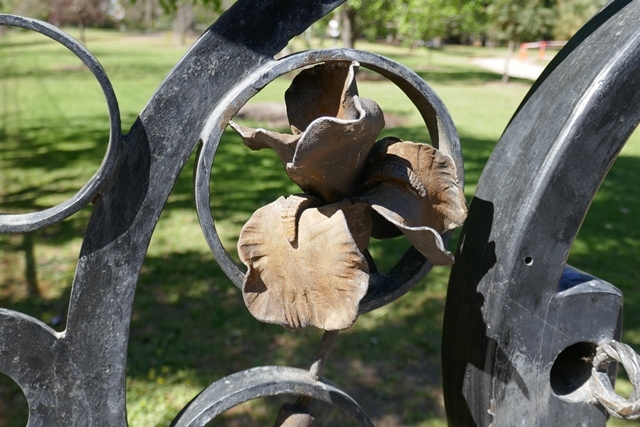 A walk around the perimeter of the Gardens is recommended to take in both the stature of the gates and the detailed plant and St Kilda references. Steel is like clay in his hands. Look at Bent Metal’s website to see a eucalypt leaf held aloft by trunks of steel. Wood also paints the Melbourne cranescapes he sees from his balcony on an ipad – they capture the crazy amount of building in Melbourne in 2018. Gyms such as Results Based Training are opening in former car repair shops. Laurent Gallery, a project of artist Titane Laurent, hosts art exhibitions and has artist studios for rent. The smell of baking sourdough bread escapes the roller door at Brasserie Bread. On both corners of Thistlethwaite and Boundary Sts town house type developments are approved and under construction. Thistlethwaite ends at Boundary Street, once the border between Port and South. While the big developments in Fishermans Bend make the headlines, there’s plenty going on in Thistlethwaite St.
Keep track of development in Port, South and Fishermans Bend at Port Houses.